Respirable crystalline silica (RCS) dust exposure is at the centre of a campaign commencing soon by WHSQ Inspectors because of the harm it can cause Queenslanders. Silica is silicon dioxide, a naturally occurring widely abundant mineral that forms the major component of most rocks, soils, sand and clay, and is in products such as bricks and concrete. There are non-crystalline and crystalline forms of silicon dioxide. Crystalline silica is also known as free silica. Quartz is the most common form of cystalline silica and is found in concrete products, fibre-cement sheeting, bricks, blocks, tiles and pavers, along with begged materials such as cement, tile adhesive and mortar. Crystalline silica dust particles which are small enough to penetrate deep into the lung are termed respirable. Work processes such as cutting, sanding, carving, grinding, blasting or polishing materials containing silica can generate respirable crystalline silica (RCS) dust. RCS dust particles are so small they cannot be seen under ordinary lighting and the primary route of entry into the body is through inhalation. Being so small the RCS dust particles can hang in the air for extended periods and they can be inhaled deep into the lungs causing silicosis. Silicosis is a serious and irreversible lung disease that causes permanent disablement and early death, and it is made worse by smoking. It usually follows exposure to RCS over many years, but extremely high exposures across the short-term can cause it to develop rapidly. Exposure to RCS has been linked to lung cancer and may also contribute to chronic obstructive pulmonary disease (COPD). Crystalline silica has been the subject of regulation in Queensland’s workplaces since 1995. Details of general requirements can be found in the WHS Regulation, Chapters 3 and 7.1 dealing with hazardous chemicals. Workplaces supplied with products comprising silica (such as sand) and all workplaces where silica containing dust is generated in a process are subject to the WHS Regulation. The WHSQ campaign will focus on the risks associated with RCS and will initially target tier 1 and tier 2 builder’s workplaces. Work must be done in compliance with safe work method statement – WHSR s300(2). cleaning of sites involving dry sweeping, compressed air or blowers on dusts likely to contain silica. 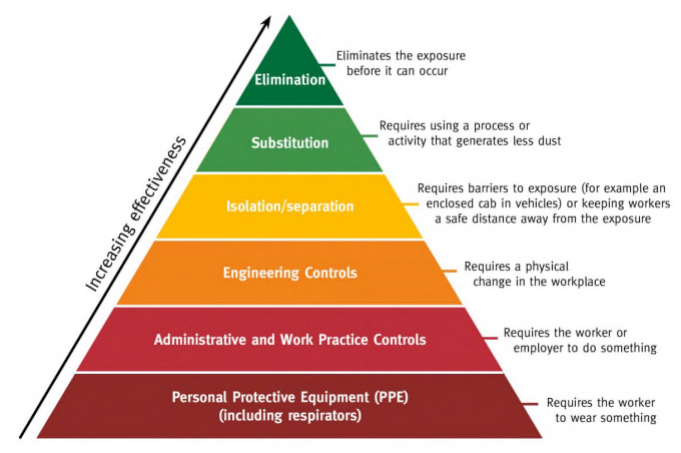 As provided for by the Guideline for Management of Respirable Crystalline Silica in Queensland Mineral Mines and Quarries Mining and Quarrying Safety and Health Act 1999 the Building Supervisor shall ensure that personal protective equipment (PPE) is used as a short-term control until higher order controls are developed and implemented. The selection, use and maintenance of respiratory protective equipment must conform to AS/NZS 17154. Just as we have become aware of the hazards associated with asbestos and mould, we too must ensure that our trades and customers are adequately protected from RCS dust.